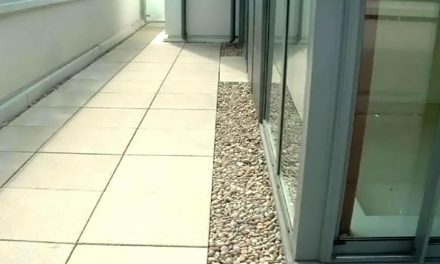 Commercial buildings often have flat roofs, which are notoriously prone to leakage. In fact, The National Roofing Contractors Association estimates that up to 40% of flat roofs develop serious problems within one year of installation. 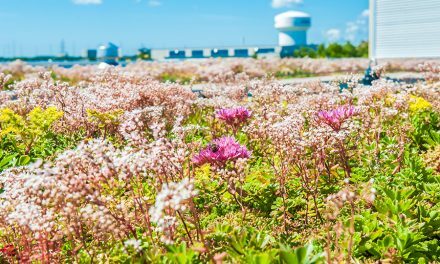 With the increased popularity of green roofs, walkways, plaza decks and solar panels, the ability to quickly find and repair faulty roofing membranes has never been higher. Leaky roofs cost American businesses billions of dollars annually, with damage ranging from minor water stains and electrical outages to complete structural failure of the roof. 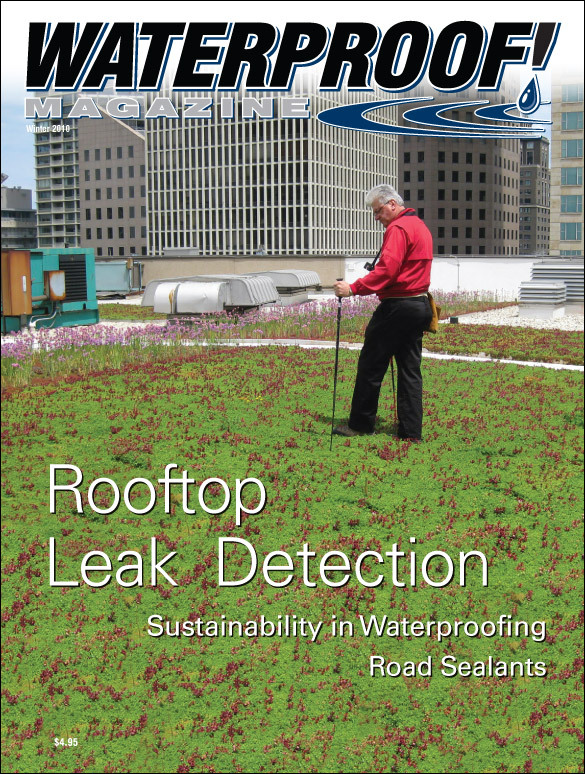 In addition to testing existing roofing, many owners want to verify newly installed flat roofs are leak-free before taking possession of the building. New leak detection methods eliminate the mess and hassle associated with flood testing. Using traditional methods, this testing can be time-consuming, messy, and actually damage the roof. In recent decades, though, new technology has been developed that avoid these problems, saving time, money and equipment, and locating even the smallest breaches in the membrane. 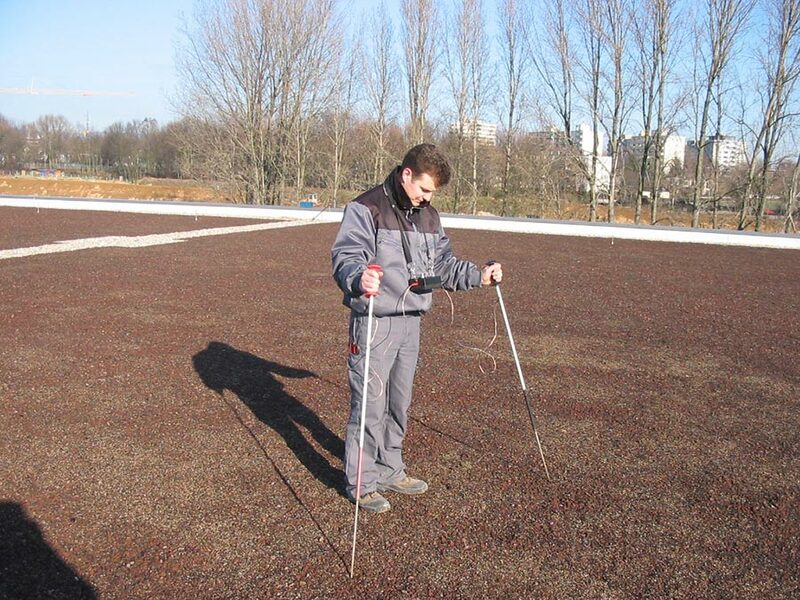 For many years, the most common method of testing for roof leaks has been flood testing. The cost for replacing a roof membrane is about one-tenth the price of replacing the entire roof, so owners see it as a cost-effective precaution. Additionally, a new roof can be tested before the ballast and other “above membrane” components have been installed. 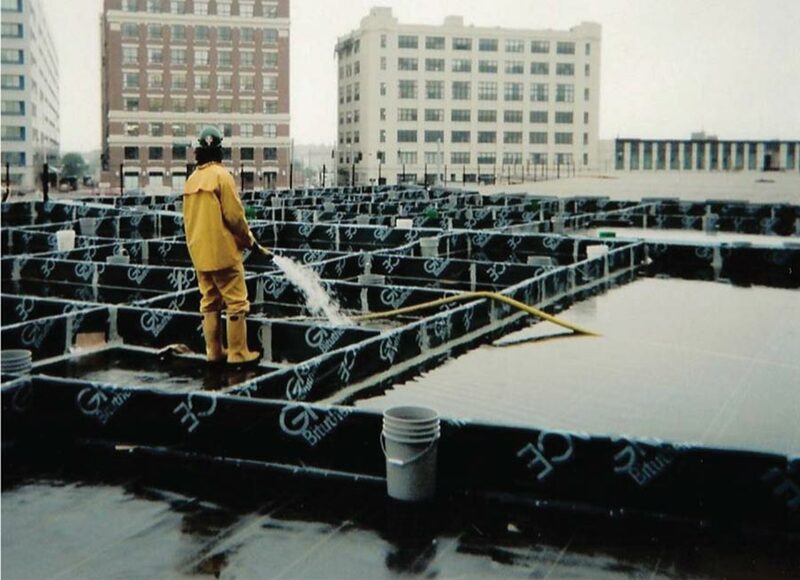 ASTM has even developed standards for the procedure, which are detailed in ASTM D5957, “Guide for Flood Testing Horizontal Waterproofing Installations.” The test crew installs plugs in all the drains and covers the entire roof with a minimum of one inch of water. This water is left to stand for at least 24 hours. Wooden dams or curbing can be applied to prevent water from flowing over the sides of the building, or to test the roof in sections. 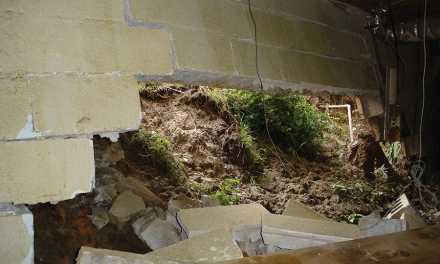 They also note that flood testing can cause irreparable damage to the roofing system, due to the weight of the water. If flooded to a depth of two inches, it would add 10 lbs. per sq. ft. to the dead load. Because even “flat” roofs have some slope, though, the weight of the water needed is often twice as heavy. Finally, the CRCA points out that transitions and joints that rely on sealants, compression bars etc, may fail under the hydrostatic pressure generated, and if a leak was detected, it could not be stopped until all of the water was drained from the roofs. Fortunately, companies have developed an array of alternative leak detection methods. Proponents claim they these technologies are non-invasive, non-destructive, and far more reliable than flood testing and direct observation. The most popular are Infrared Thermography, Nuclear Moisture Testing, Electrical Impedance Testing, and Electric Field Vector Mapping. The first three techniques actually test for water in the roof assembly. The last two will actually pinpoint the leak, even if it’s too small to be seen easily. Here’s how these techniques work. Infrared Thermography is based on the principle that water—and wet insulation—changes temperature more slowly than dry roofing components. As night begins to fall and temperatures drop, dry insulation in the roof will cool quickly while the wet insulation holds its temperature. Using an infrared camera, the thermographer sees which areas are warmer than the surrounding components—which usually indicates wet insulation. “A visual inspection of this area will almost always locate the point of water entry,” he says. For this method to be accurate, the membrane must be dry and the test must be done at night. “The best results typically occur on cool, clear, calm nights following clear, sunny days,” says Mike Wilson, a roof consultant at Benchmark, Inc.
ASTM Standard C-1153 outlines proper procedures for infrared testing. “The job of the infrared thermographer is not to simply find the leak, but to locate the extent of the wet insulation,” says King. It also involves removing the water in the roof assembly, as it could rot or corrode components. 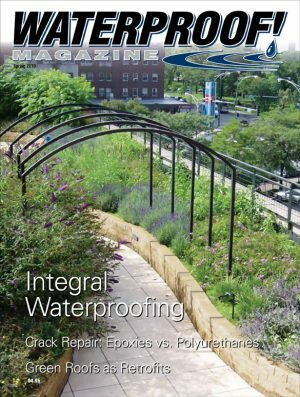 “Only by repairing both the membrane and the insulation can the life of the flat roof be extended,” he says. Infrared thermography does have drawbacks. For instance, insulation that doesn’t absorb water—such as EPS foamboard or closed-cell spray foam—don’t return good results. Also, an area might appear warm because of mechanical equipment, heaters under the roof deck, or a thinner gravel surfacing. Nuclear Moisture Testing works like a type of atomic radar. It’s sometimes called Nuclear Hydrogen Detection, since it actually detects hydrogen levels, not water. The tester uses a hand-held device that emits a stream of high velocity neutrons. When the neutron strikes a hydrogen atom, it bounces back to the device at a slower speed. Since water has a high percentage of hydrogen atoms, the machine can interpret the results as a percentage of moisture. 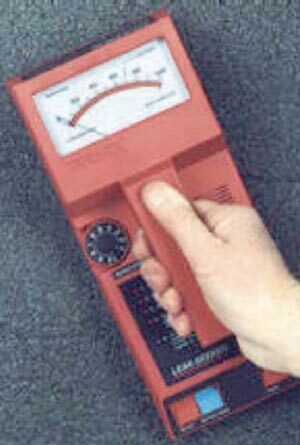 Interestingly, asphalt also contains a large percentage of hydrogen atoms, so a baseline reading needs to be taken in a known dry area of the roof, from which the meter can be calibrated. The rest of the roof is tested at intervals, typically a 10’x10’ grid but sometimes 5’x5’. Electrical Impedance Testing: This roof testing technology produces results very similar to the test above. Because water conducts electricity, wet insulation provides less resistance to electrical current than dry insulation does. As in nuclear moisture testing, a grid is set up, and readings taken at each point. High readings indicate the probability of moisture intrusion, which is then verified using core samples. The technology is very similar to the instruments used to measure moisture content in the lumber and paper industries. Two new leak detection technologies have recently been imported from Europe. Electronic leak detection comes in two different varieties, high voltage and low. For the purposes of this article, low-voltage impedance testing is referred to as Electric Field Vector Mapping (EFVM). Both have advantages over nuclear, infrared, and impedance testing in that they pinpoint the actual breach in the membrane, not simply the presence of water. 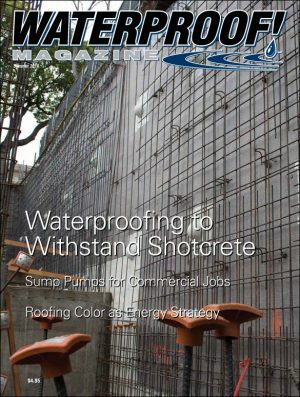 The key to these methods is that water conducts electricity very well—at least 10 times as well as most roofing membranes. High-Voltage Electrical Testing: The high voltage method uses relatively high voltage but low amperage. It requires the structural roof deck to be conductive (either metal or concrete) and the membrane to be an insulator. The membrane must also be completely exposed. One electrical lead is connected to the roof decking, and the other is attached to device resembling a push broom with copper bristles. 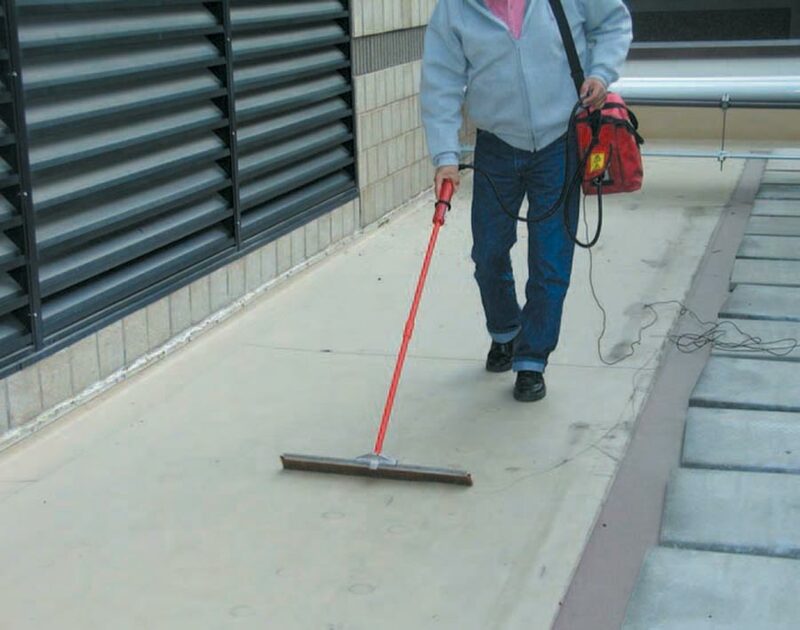 As the operator “sweeps’ the surface of the membrane, any moisture or breach in the membrane will complete the circuit between the measuring device and the roof deck. At least one company markets a conductive glass felt that can be embedded under or between layers roof membrane as it is being installed. This “detection membrane” makes it easy to check for leaks on a regular schedule. It can even be continuously monitored via computer. And if a leak is detected, the system can locate it. Electric Field Vector Mapping uses lower voltages than the system just described, and has several advantages over other testing methods. For instance, EFVM works on exposed, ballasted or concealed membranes, and the roof doesn’t have to be perfectly dry. It can be employed on vertical, sloped or flat surfaces, overburden can stay in place during testing, and it locates leaks and breaches with pinpoint accuracy. EFVM involves wetting the top of the membrane to create an upper electrical “plate”. Often, the overburden will contain enough moisture that wetting the roof is not necessary. 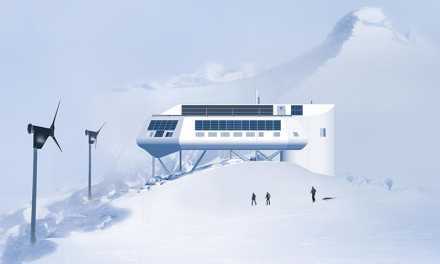 Like the high-voltage system described above, the structural deck acts as the lower electrical plate, and the roof membrane located in between acts as the insulator. The high-voltage method uses the roofing membrane to insulate the roof deck from the testing device. Any breach in the membrane will create a short circuit, alerting the operator to the failure. Chris Eichhorn, an executive at International Leak Detection, adds, “Unlike most other leak detection methods, [EFVM] can locate the point of entry quickly and accurately.” The work can be done during daylight hours, and leaks that are too small to find visually are as easy to locate as a large tear or failed seam. Leaky roof membranes cause billions of dollars in repairs every year. Fortunately, it’s easier than ever before to find and locate leaks. At least five non-destructive methods exist, each with their own advantages and drawbacks. Several years ago, a scientific study was conducted to determine which non-destructive method produced the most accurate results. 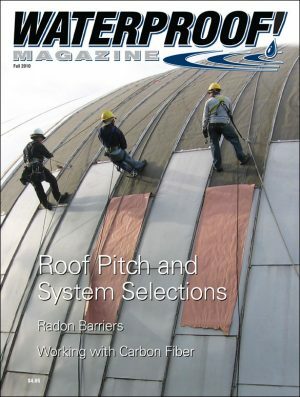 Three experts tested a 120’ x 200’ foot roof known to have leaks with infrared, nuclear, and impedance leak detection systems. (High voltage and EFVM were not tested). In the end the system that works best for you will be determined by the size of the roof, the extent of the damage, and the cost and availability of testing in your region. If the roof was tested using spray or flood testing, or if wet insulation was indicated using infrared, nuclear, or impedance testing, the actual breach will still need to be located through direct observation. Water stains on the ceiling are often a tell-tale sign, but when a flat roof leaks, finding the source is sometimes difficult, since the water may travel some distance—in any direction—from the actual membrane failure to where the water appears on the ceiling. To locate the breach, repair crews must be able to see the underside of the actual roof sheathing. Often, this requires accessing the attic, removing ceiling tiles, or cutting through the wallboard around the suspected leak site. Depending on the size of the job, it can be messy. The contents must be removed from the affected area; floors must be protected. Sometimes scaffolding has to be brought in to reach the ceiling. Once the source of the leak is found, the location is transferred to the upper surface of the roof, and the repairs can begin. offer a few tips to help locate the elusive leaks. Start with Transitions: Flashings, seams, and penetrations are the weak spots in any roof design, so they’re the most likely location for a leak to develop. Check to ensure that flashings are properly installed, sealed, and overlapping the membrane on the downhill side. Flashings on the roof edges are especially susceptible to damage. Any cracks, openings, or breaks in these flashings is a potential entry point for moisture. Seams are another likely source of trouble. Check for holes, cracks, or adhesive failures. If any edge of any seam is not firmly adhered to the layer below it, the area will need repair. Look for Lake Beds: If a flat roof is truly zero slope, water will collect in every low spots. These low spots are often visible as rings of dirt. On a dark roofing membrane, these areas appear lighter because they collect the dust and debris washed off the other areas. Seams or flashings in these “dry lake beds” are especially suspect for leakeage. Green is big business right now. New techniques and products that are both sustainable and effective can improve the environment and your bottom line. 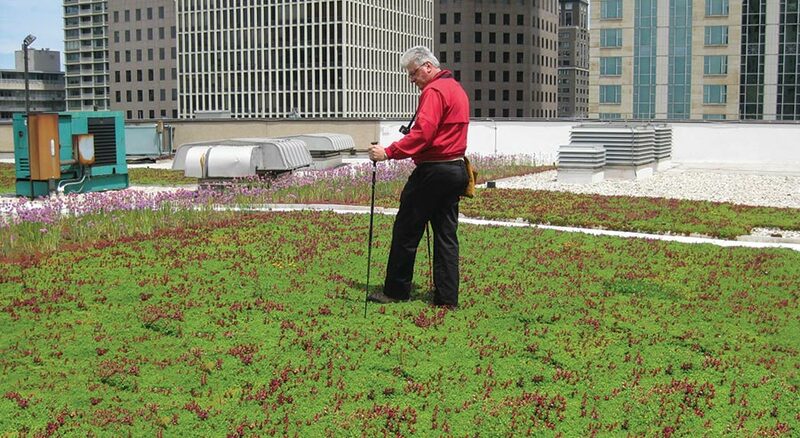 Traditionally, testing commercial roofs for leaks can be time-consuming, messy, and actually damage the roof membrane. But new technology can end that, saving time, money and equipment, and locating even the smallest breach in the membrane. Sealants used on bridges and elevated sections of highway have to perform in extreme conditions. Interstate 70 west of Denver provides an extreme example.